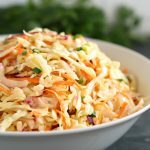 This Best Ever Creamy Coleslaw is the only coleslaw recipe you'll need for all your summer parties and barbecues! It's easy to make with just a few simple ingredients! Add the mayonnaise, honey, mustard, vinegar and salt and pepper to a mason jar and shake until smooth. Set aside. Add the shredded cabbage, shredded carrots and red onion to a large bowl. Pour the dressing over the cabbage mixture and toss well until full coated in the dressing. Garnish with sliced green onion and serve. Store in the fridge for up to one day ahead of serving, if desired.